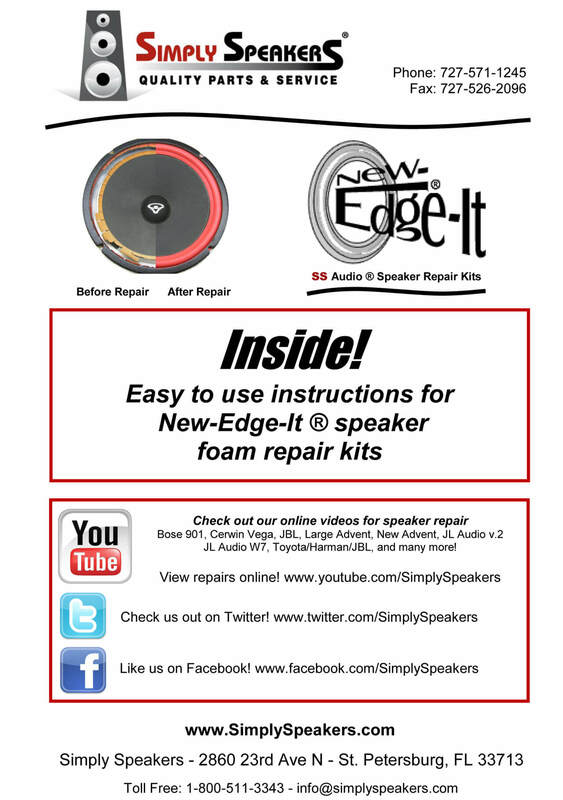 We stock and ship more speaker repair kits than anyone! 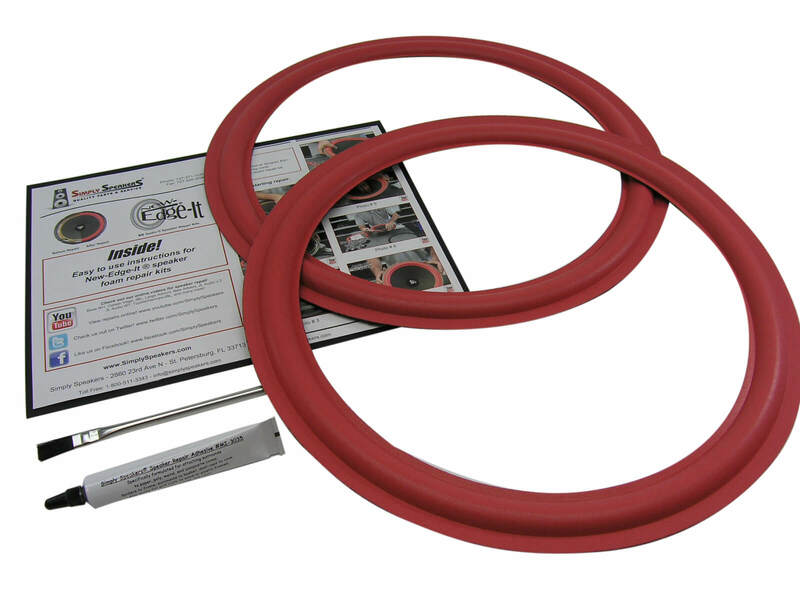 Brand NEW formula polyether foam rubber surrounds last much longer than the originals. Our special CLEAR speaker repair adhesive part # MI-3035. For paper, poly, & composite cones. NO generic glues or Elmer's type white glues like others sell. 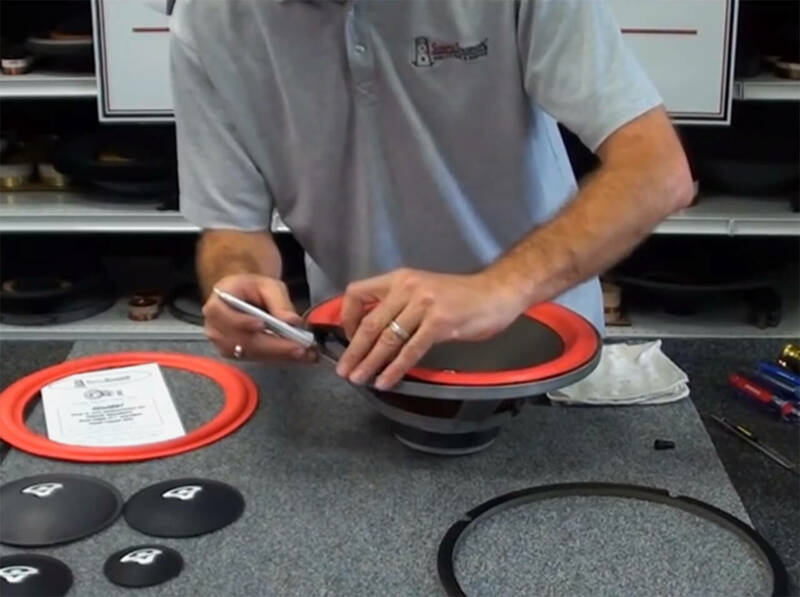 Access to our complete library of how-to speaker repair videos on YouTube! 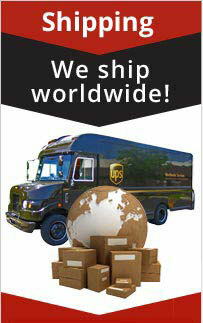 Fast and FREE shipping to any USA address. Economical and Environmentally friendly - Save money and save your speakers. 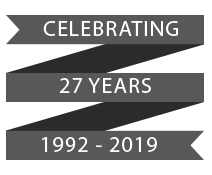 Simply Speakers® - Quality Speaker Parts since 1992! Great product. Installed this kit by using the online video for my 20+ year old Cerwin Vega speakers and they are like brand new again. 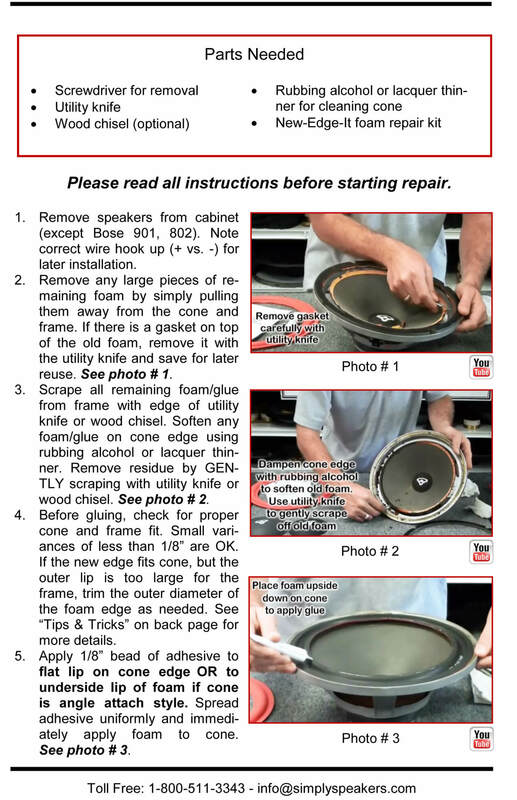 I would recommend these speaker repair kits to everyone. The ordering and shipping was very fast and easy. Prompt delivery. Goods as described. Really happy with the quality of the product. Turned out great on the speaker. Great Kit easy to use. Worked just as advertised. Installation video was extremely helpful. O had a little problem with my last order. The box was bent on half on my order of two 15 " foams. I opened the box and found two wrinkles on the foams. I didn't see a problem at that point but I did after installing the first foam. The foam had come loose at that wrinkle. I reglued, but it too came loose. I tried to save the foam when I was removing it after trying what I knew to do. The foam split at the wrinkle and was destroyed. I took the second foam and heated it along the wrinkle and softened up the area. The second foam went on perfectly. I think they should include on their excellent instruction sheet a trouble shooting section. I need to order another foam and I will order it from Simply Speakers. 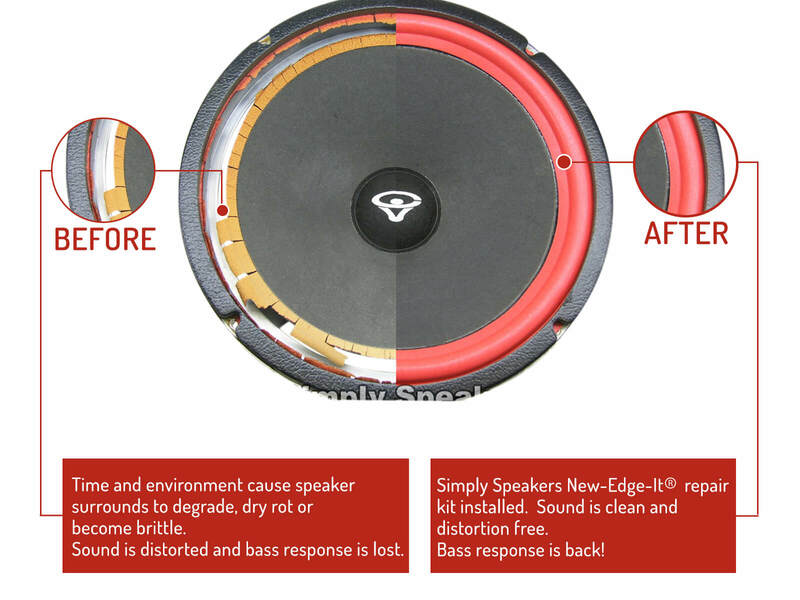 I still think they are tops!..............................Response from Simply Speakers: Thanks for the review, and sorry to hear about the damage issue. We have set you up for a no charge replacement surround and glue to be shipped out no charge today. Awesome. Purchased because of YouTube video. Easy to install and work fantastic. Easy for a novice to install. Great repair kit. Relatively simple process, mostly scraping off the old stuff, and the speakers sound fantastic. Q: What is the difference between the FSK-15 and AR? A: The FSK-15AR is for an angle attach cone, and the FSK-15FR is for a flat attach cone (small flat lip around the upper edge of the cone). 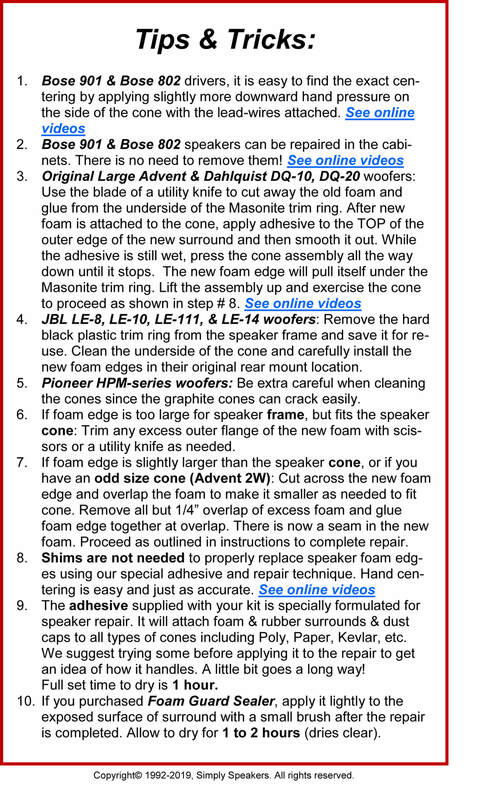 Q: I have Cerwin Vega D9's which kit do I need? A: FSK-15FR. This is the correct kit for the Cerwin Vega D9 woofers. A: Your model (E-315) uses kit # FSK-15FR. Thanks! Q: SHOULD I USE AR15 OR FR15 FOR CV DX 9 SERIES, 15" SPEAKERS? A: Please order kit # FSK-15FR for the Cerwin Vega DX9. Thanks! 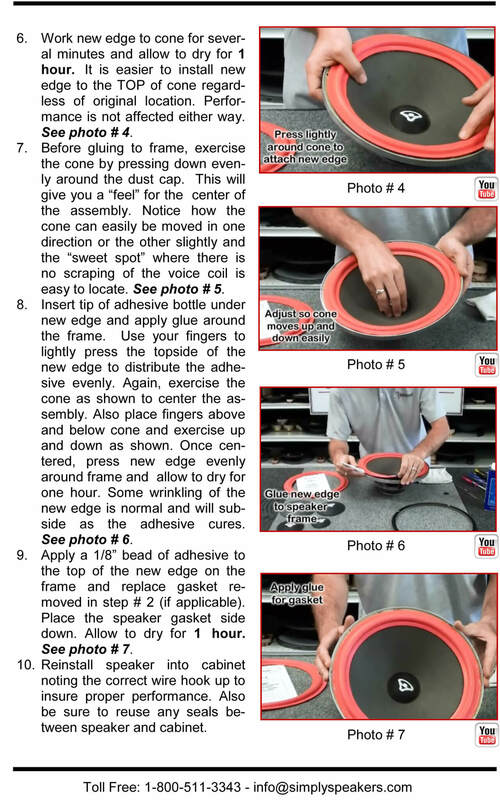 Q: Will this foam kit work on the cerwin vega model 152WR 15" speaker? 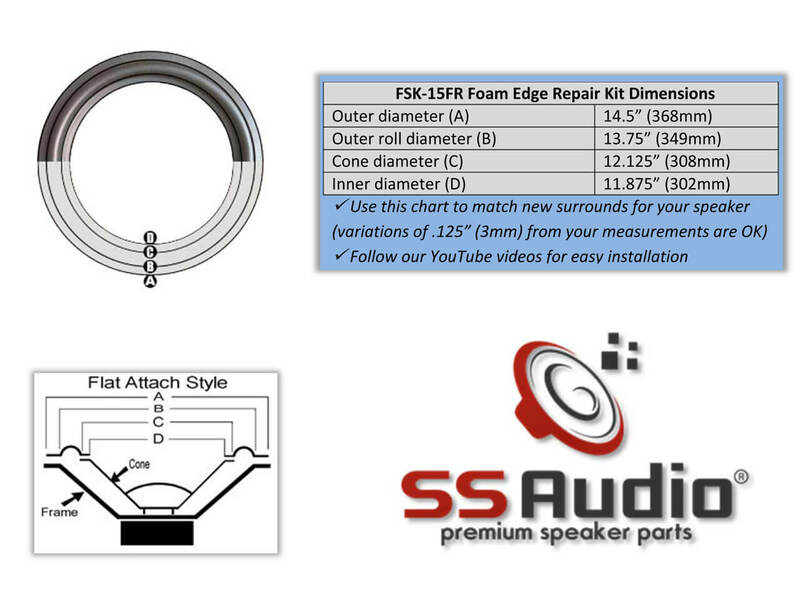 A: Yes, the FSK-15FR is designed for the 152WR woofer speaker. Q: does this kit fit my cerwin vega dx-9? A: Yes, this kit fits the Cerwin Vega DX9. Q: I have the VS-150 and only see VSW15, but I can not see or read any other numbers. Is this the correct kit for Cerwin Vega VS-150? A: Yes, this kit will fit the D9 and the D9E. Thanks! Q: which 15" foam kit do I need for my MX 400 CV speakers ? These speakers have 8 screws not 4 . A: Yes, this kit # FSK-15FR is correct for your model MX400. Thanks! Q: WhatsApp is the différence between fsk15AR and the fsk15 FR ? A: The FSK-15AR is for an angle edge cone and the FSK-15FR is for a flat edge cone. Cerwin Vega: D-9, D9, DX-9, DX9, DC15, DC-15, DC 15, EE-2030, EE2030, EE 2030, 152W, 152-WR, 152WR, 15W1, 15W-1, 15W-4, 15W-6, 153W, 154W, 154WT, 15W5, 215-R, 215R, 217-R, 217R, 316-R, 316R, 317-P, 317P, 15T, 152WHF, 2000-15, A316R, A504R, AL-1000, CH-504R, CVW-15, CVW15, D15EE, D-8, D8, D-8EE, D15-EE, DCW-15, DXW-15, H15, HED-15, HED15, HTW-151, HTW151, M-100, M100, M-15, M15, MX-400, MX400, MXW-15, MXW15, PD-3, PD3, RE-38, RE38, REW-15, REW15, R-28, R28, S-2EE, S2, U-15,U15, U-351, U351, W-15, W15, and many more!